We manufacture pallets in quantities from small batches to mass volume production. If you’re looking for wooden pallets at the right price at the right time look no further! We are one of the UK’s leading pallet manufacturers, with an excellent reputation for quality and service and over 30 years’ experience in the industry. Our high level of automation, combined with our flexibility ensures that we are able to supply any size order, to the largest volume requirements 24 hours a day throughout the UK mainland. We have on site facilities for the heat treatment of pallets to ISPM 15 standard to meet export regulations. Pine Products Limited also offers reconditioned pallets, repair of used pallets and repatriation of pallets. We manufacture in excess of 35,000 new pallets per week to over 200 different specifications. Why spend money on new pallets when you can make the most of your existing stock? We will collect sort & grade used pallets with the aim of repairing as many pallets as possible. We supply a range of bespoke, timber packing cases & crates suitable for your individual shipping requirements. Any damaged pieces of wood are recycled in order to fulfil our zero waste to landfill policy. Pine Products Limited is a highly automated company, with a range of automatic and semi-automatic machines able to manufacture pallets in quantities from small batches to mass volume production. 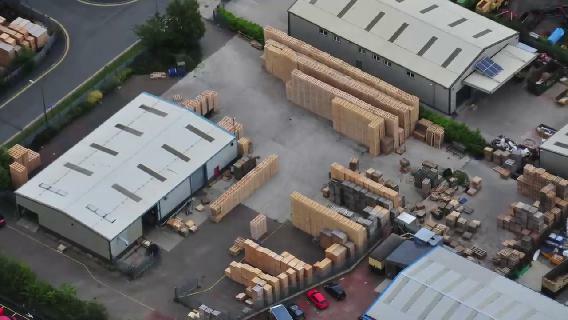 We manufacture in excess of 35,000 new pallets per week to over 200 different specifications. We can supply to customer own specification or we will work with you to design a pallet suitable for your needs, using the latest pallet design software. We have on site facilities for the Heat Treatment and Kiln drying of pallets to ISPM standard to meet export regulations.